The Water Street Inn is a charming and distinctive retreat set on the banks of the St. Croix River in Downtown Stillwater, Minnesota. The historic inn blends modern day comforts with the elegance and grace of a bygone era and features comfortable Victorian guest rooms and suites with classic décor and furnishings, a restaurant and Irish pub, and modern conference facilities. Some of the rooms and suites have double whirlpool baths, gas fireplaces, and private balconies overlooking the river and the Inn has an elegant lobby with rich period furnishings and the building’s original tin ceiling. Guests can enjoy a complimentary breakfast every morning at Charlie’s Restaurant, which also serves lunch, dinner and a popular Sunday brunch. The Inn also features a beautiful ballroom for special occasions such as weddings, receptions and corporate gatherings, along with an outdoor veranda with stunning views. 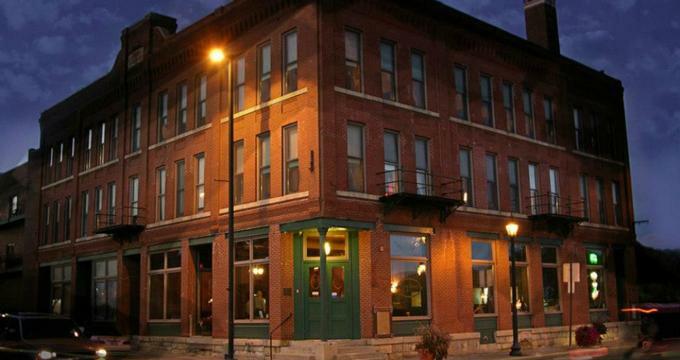 Located in the nationally registered historic district and celebrated the community of Stillwater between the St. Croix River and Main Street, the Water Street Inn is ideally situated for exploring the city and all its attractions, including a variety of restaurants, bars, museums, galleries, and other entertainment. The Water Street Inn features beautifully appointed and stylishly decorated guest rooms and suites with lovely views of the St. Croix River. All accommodations have plush queen or king-size canopy beds dressed in deluxe linens and designer duvets, and en-suite bathrooms with walk-in showers, double whirlpool baths, plush towels and bathrobes, and lush bath products. Guest rooms and suites have spacious sitting rooms with comfortable armchairs and sofas, gas fireplaces, and private balconies with stunning views of the St. Croix River. Guests can enhance their stay with a range of romantic packages such as the Bed, Breakfast and Dinner Package, which includes a three-course dinner in Charlie’s Restaurant, complimentary Irish tap beer or house wines in Charlie’s Irish Pub, and a gourmet breakfast in the morning. The Birthday Package includes an overnight stay in one the Inn’s Water Street Rooms, an in-room bottle of wine, a four-course Dinner for two in Charlie’s Restaurant, and a gourmet breakfast in the morning. Romantic extras include cheese and wine basket, a bottle of house wine, and a fruit and cheese platter. The Chocolate Indulgence Package features a bottle of Champagne along with assorted chocolates and truffles on arrival, and the Dozen Red Roses Package includes the delivery of a dozen red roses and a keepsake vase. Other special packages and extras include floral arrangements; a single rose in a vase and in-room massages. The Water Street Inn is home to Charlie’s Restaurant, a casual, family-friendly restaurant that serves local and regional cuisine prepared from fresh, locally sourced ingredients, and an extensive list of drinks. Guests can enjoy a gourmet breakfast every morning, as well as lunch and dinner in a casual yet elegant setting with breathtaking river views. Charlie’s Irish Pub is a favorite local venue for gathering after work or sharing a drink with friends and offers live music in the evenings. The Water Street Inn offers an array of amenities and guest services, including a 24-hour front desk and variety of concierge services, an onsite restaurant where guests can enjoy breakfast, lunch and dinner, and an Irish pub that offers live music every evening. The Inn has air-conditioning in public areas, complimentary wireless Internet and free parking for guests, and boasts modern meeting spaces for functions and events such as weddings and corporate gatherings. The Inn also has a 300 square foot patio with beautiful riverfront views and a grand ballroom for special occasions. The Water Street Inn offers a stunning venue for special occasions like weddings, receptions, and other celebrations of up to 300 guests, along with a range of beautiful sites to choose from and a variety of professional services. Venues for both ceremonies and business gatherings include Victoria’s Ballroom, three other smaller ballrooms, and the River Foyer room.